21-Jun-2001 -- After a couple of weeks of cool, dreary, rainy weather the first day of summer turned out to be a warm, sunny summer day with the temperature reaching 30°. It was a great day for finding another confluence. We set off from Regina at 10:00 AM heading west to the city of Moose Jaw to pick up our friends Gladys and Grant. Grant had a new GPS he'd never used so was anxious to give it a try. We packed picnic supplies in our van and headed south from Moose Jaw on Highway 2. At the village of Mossbank we left the paved highway to begin honing in on our confluence using gravel grid roads. Heading north from Mossbank we spotted Old Wives Lake in the distance so knew we were getting close. We followed the trail around the edge of the lake. The trail passed over a Texas cattle gate into a community pasture of mixed prairie grasses where a herd of cattle were feeding near the edge of the lake. Following the readings on Alan's and Grant's GPS's we turned onto an even narrower trail across the prairie that ended at a corral. Leaving our van parked beside the corral, we climbed through the barbed wire fence and walked along cow paths across the pasture towards our destination. Our walk was about 600 meters with Alan's GPS reading the confluence at a distance of about 5 meters from where Grant's GPS was reading it. Standing half way between the two GPS's, Carolyn took the photos of the view in each direction. The view north shows Old Wives Lake, a very large, shallow, saline lake. Approximately 26,000 hectares of land around and including the lake are owned by the Provincial Government and designated as a bird sanctuary. It is an important breeding area for many species of ducks and a spring and autumn staging area for large concentrations of ducks, Snow Geese and Tundra Swans. 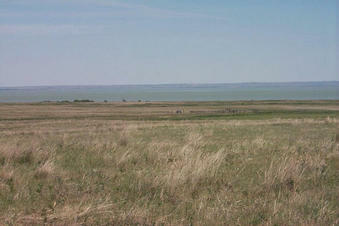 Many shore birds and varieties of prairie birds nest in the area. Pelicans, Herons, Cormorants and Terns nest on an island in the lake. Recreational use of the lake is low due to the turbid water, rough shoreline and fluctuation of water levels. Back at our van we took a picture of ourselves in the cattle corral as well as a few other shots around the corral. We spotted 2 trees near the lake we thought could provide shade for our picnic so drove towards them. Choosing the larger tree, we set out our folding chairs and settled in only to discover that flying insects were swarming about and biting us. We moved into the sun and were left in peace to enjoy our lunch. Traffic was slow - in the entire time we spent near Old Wives Lake we did not see any other vehicle or person. The two "old wives" had their photo taken by Old Wives Lake before moving on (photo not included!). As a side trip before heading back to Moose Jaw we drove 56 km southwest to the French speaking community of Gravelbourg, population 1,200. A highlight was seeing inside the large Catholic Cathedral, Cathedrale Notre-Dame De L'Assomption, with its wonderful stained glass windows and beautiful paintings decorating the walls and ceiling. A drive back to Moose Jaw following highways 58 and 363 past vast grain fields and over rolling hills as we passed the northern edge of Old Wives Lake got us to Boston Pizza just in time for supper. After a brief visit at Gladys and Grant's and a promise to do another confluence together in July, we headed east to Regina reaching home shortly after 8:00 PM. Our 10 hour, 439 km trip was a great way to celebrate the first day of summer. #2: Looking east. Dried up small lake bed showing white saline residue can be seen. #3: Looking south. Prairie grassland. #4: Looking west. More pasture and prairie. #5: GPS readings taken about five meters apart. #6: The "confluencers". L-R: Alan, Gladys, Carolyn, Grant and Max (in front). #7: Texas cattle gate at entrances to pasture. Old Wives Lake seen on left in background. #8: Looking east from the corral near the confluence. #9: Wild roses growing by corral fence. #10: Another view looking northeast from the corral.